Talented director ​Gunasekhar​,​ who gave us ​super ​hits like Okkadu, Arjun and Choodalani ​U​ndi ​is pretty determined to get back to his best​ with his latest flick Rudrama Devi​. The Anushka starrer has completed it shoot and is busy in its post production formalities. According to the latest update, Lahari music has bagged the music rights of the film for a fancy amount. The makers are planning to release the audio in the third week of February and the film in summer 2015. 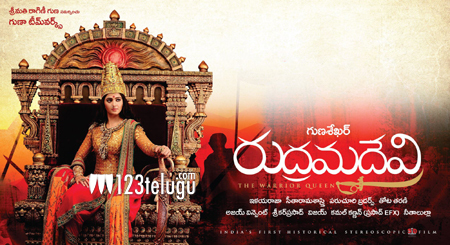 Rudrama Devi is the first historic Indian film to be ever made in 3D. Some big names like Allu Arjun​ and Rana Daggubati are also involved in this project which has music by Ilayaraja.